March 29, 2019: IMPORTANT NOTE: WatchCuts 1.0.5 now supports Shortcuts 2.2. WatchCuts lets you trigger the running of shortcuts on your iPhone and iPad from all of your connected iCloud devices. 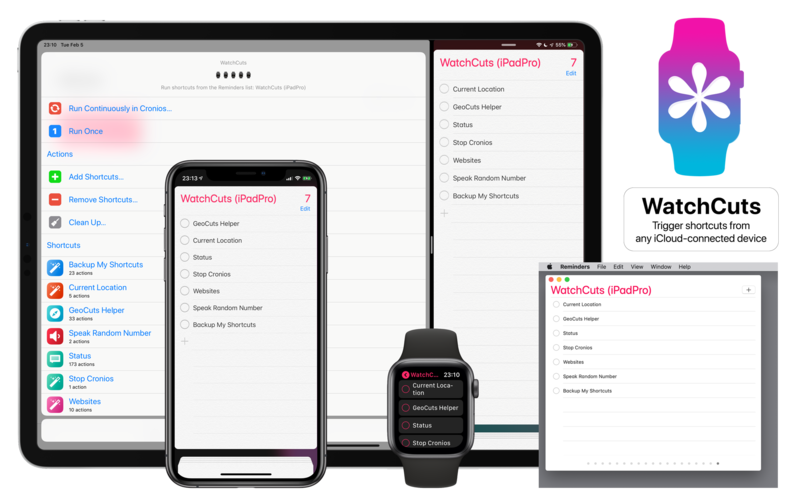 Pair WatchCuts with Cronios — the shortcuts scheduler for iOS — and have your shortcuts run automatically when you complete tasks on your iPhone, iPad, Mac, or Apple Watch! 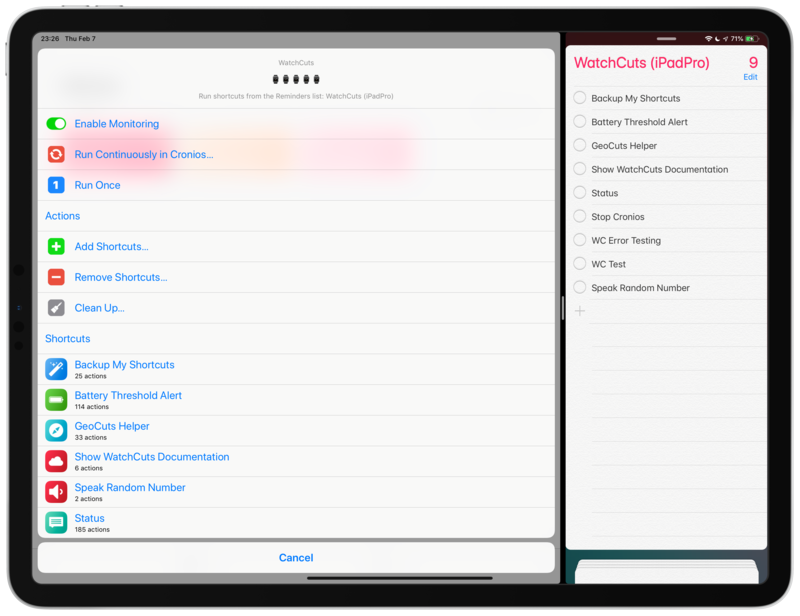 WatchCuts works by monitoring a specific Reminders list that is shared by all iCloud-connected devices. Each task in the Reminders list corresponds to the name of a shortcut on the iOS device. WatchCuts uses device-specific settings, so the shortcuts you trigger on your iPad can be different from the ones on your iPhone. When you mark these shortcut-reminders as complete, WatchCuts will know which shortcuts to execute the next time you run WatchCuts. It will then re-add the shortcut-reminders back to the Reminders list so you can check them off again. Pair WatchCuts with Cronios — the shortcuts scheduler for iOS — and have your shortcuts automatically run as you check tasks off on your iPhone, iPad, Mac, Apple Watch, and iCloud.com)! 1.0.6 - March 30, 2019, 1:26 p.m.